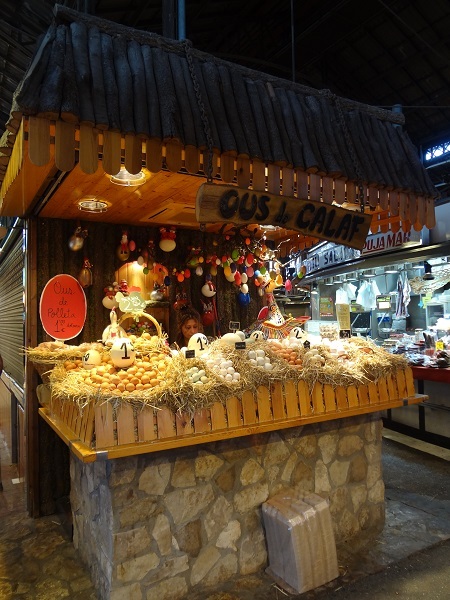 Jamie says: After our delightful market experience, we continued our walk through Las Rambas. 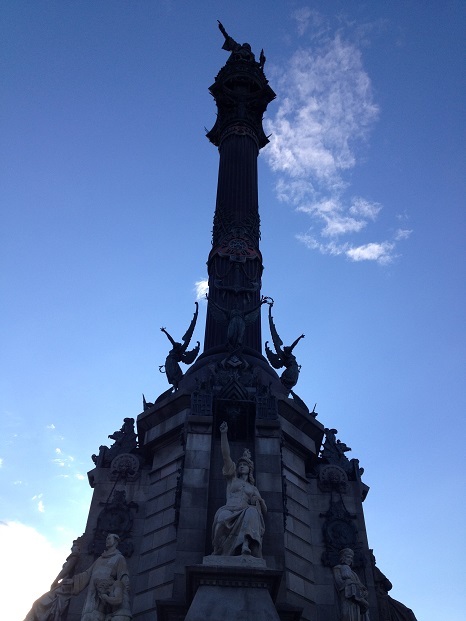 We made it to the end- to the rear side of the Christopher Columbus statue. (What a way to be greeted!) 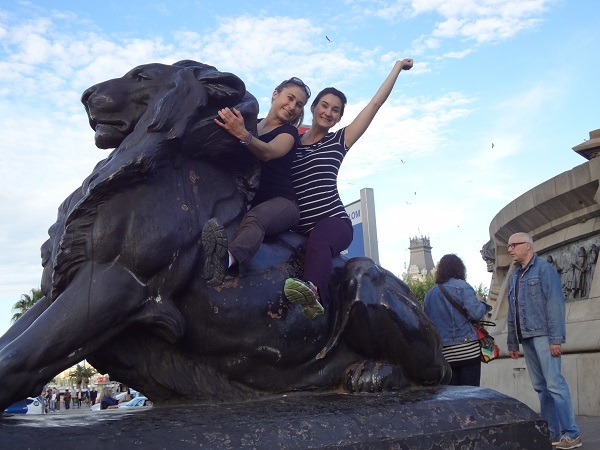 We waited ever so patiently for a little kid to finish playing on a lion statue so we could have our photo opp. K and I “rode the art,” according to my Uncle’s Facebook response to the picture. Hey, it was fun! 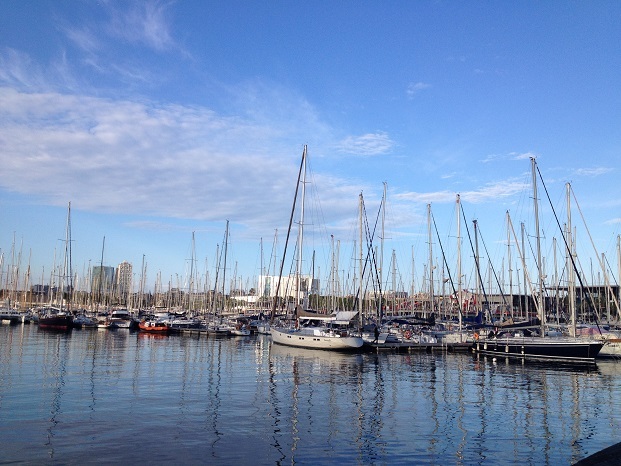 …with all the sail boats. It was quite peaceful. 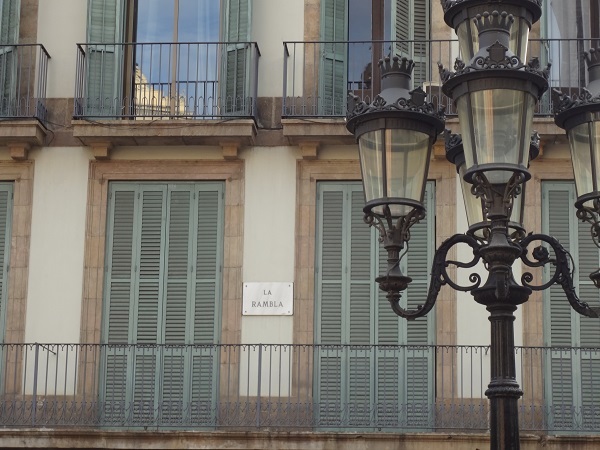 Then we looped back around to make our journey back through Las Ramblas. I was exhausted! The idea of walking back actually seemed daunting. My legs were ready to call mercy from all the walking. I would bet we averaged about 10 miles of walking a day. Who would think walking on vacation would wear me out more than the Body Pump classes and triathlon training I was doing at home! 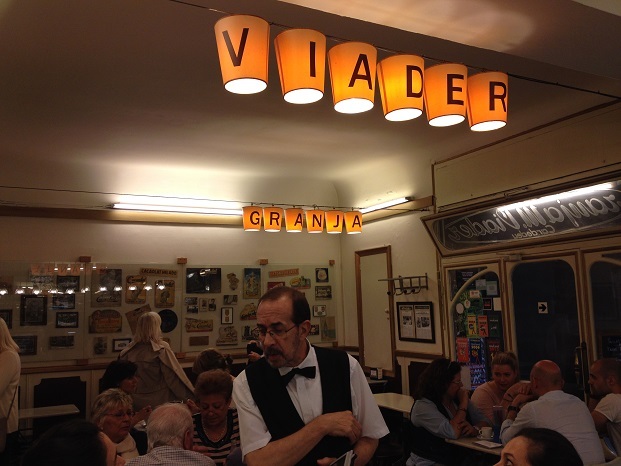 Along the way back, we stopped at a Rick Steve’s destination, an old fashioned parlor called Granja M Viader. It had charm and character. 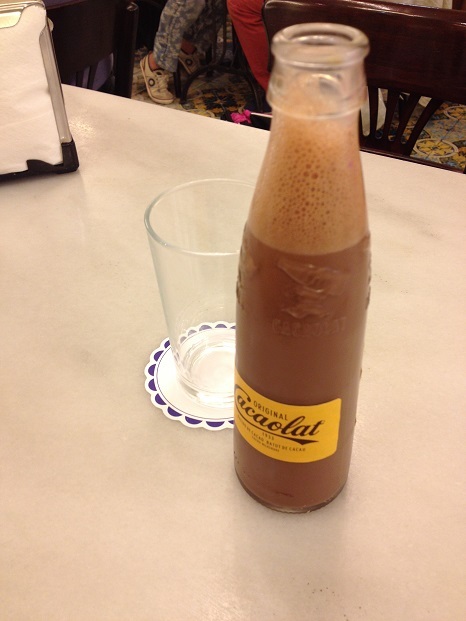 K went for the chocolate milk, which came in a cool bottle. I took a sip. It was good, too. K and I took the milk bottles home for souvenirs. Weeks later, though, we both realized we were missing our bottles. Customs must have taken them! 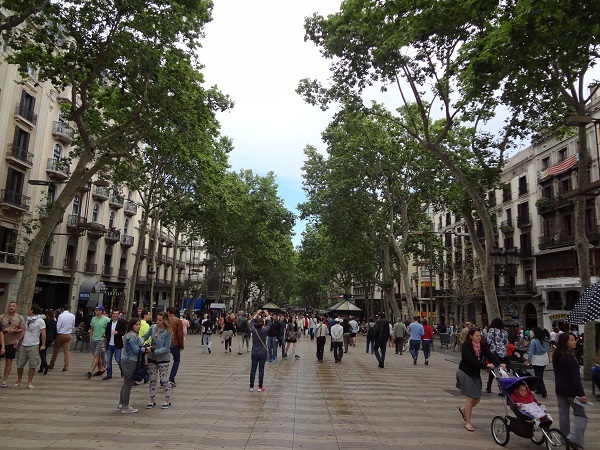 Jamie says: After our truly magnificent afternoon at La Sagrada Familia, the ladies ventured off to walk Las Ramblas, a nice long street with a car-free, paved sidewalk on steroids in the middle, flanked by roads on either side and restaurants, shops and businesses beyond the roads. 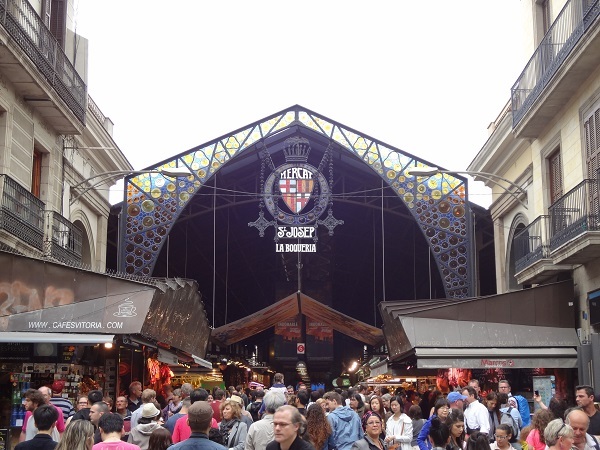 The paved part runs a good stretch of distance and has tons of interesting vendors along the way, but my favorite stop, hands down, was the market- Mercat St Josep to be exact. 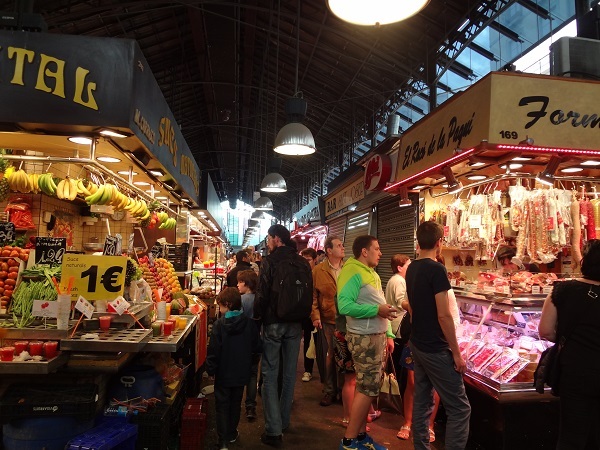 The bustling energy of the market was contagious. 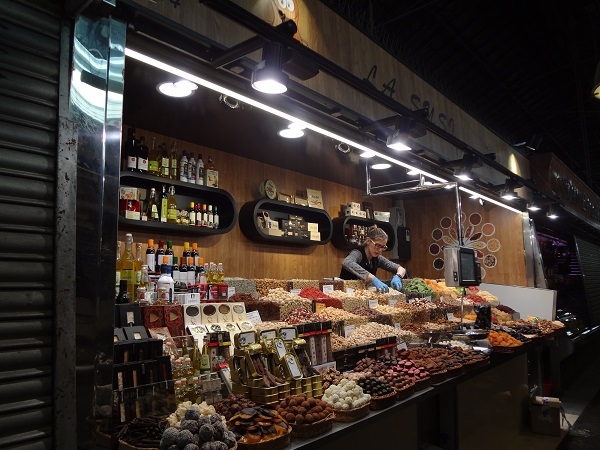 Step inside the market, and you’ll find row after row of culinary delights and earthly treats. There’s even meat hanging from the sky. I suggested we walk up and down every row, starting at the one all the way on the end (orderly me). 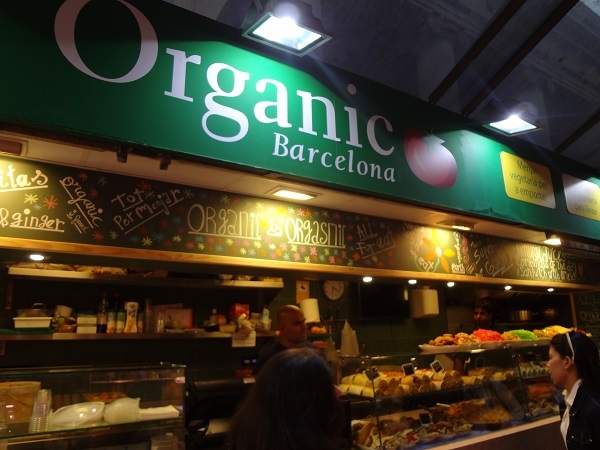 I was intrigued by a place called Organic Barcelona. 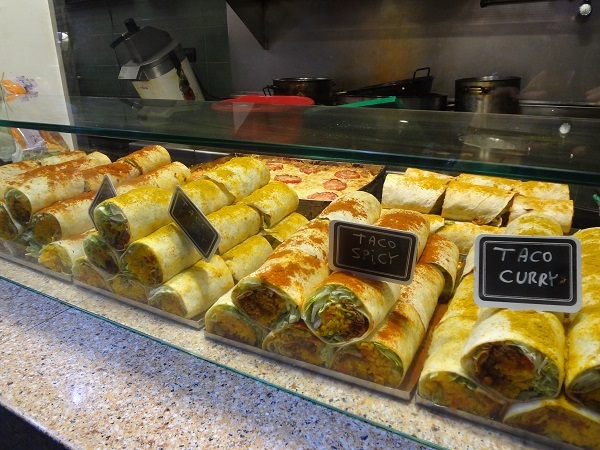 The bright ground spices on the top of their “tacos” (looked like a burrito if you’d have asked me) were appealing. 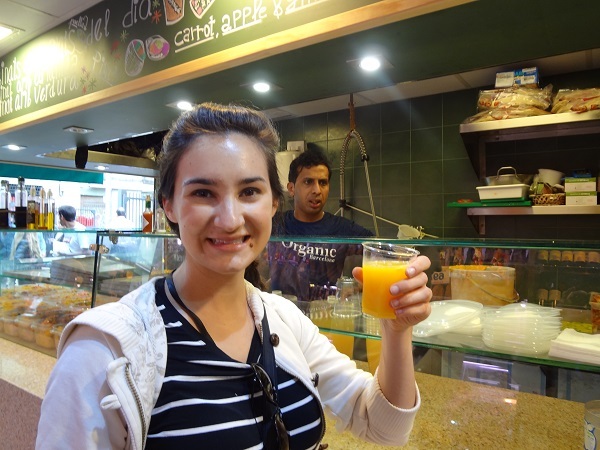 I ordered one and they brought us a freshly squeezed OJ. We decided we’d share the meal and make it a food walk. Out came the “burrito” with a plethora of sides. 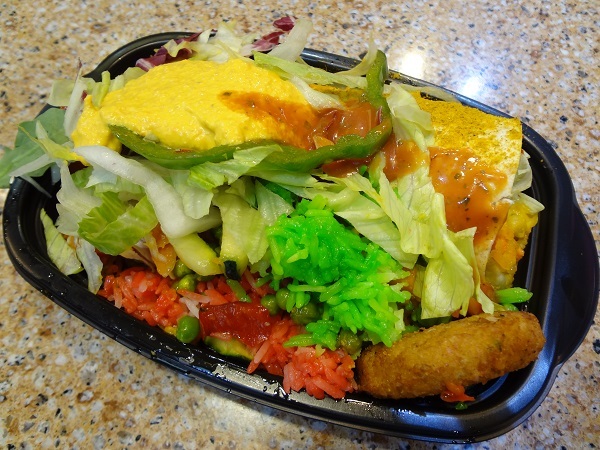 (Is that dyed rice really organic?) It was good- got my veggies in. 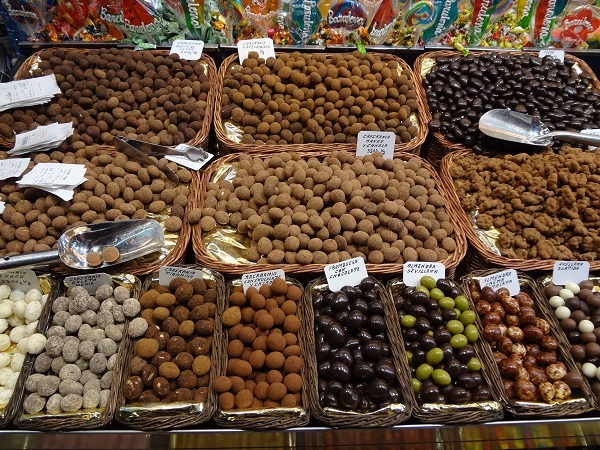 But the fun really began was we turned our walk through the market into a chocolate walk. 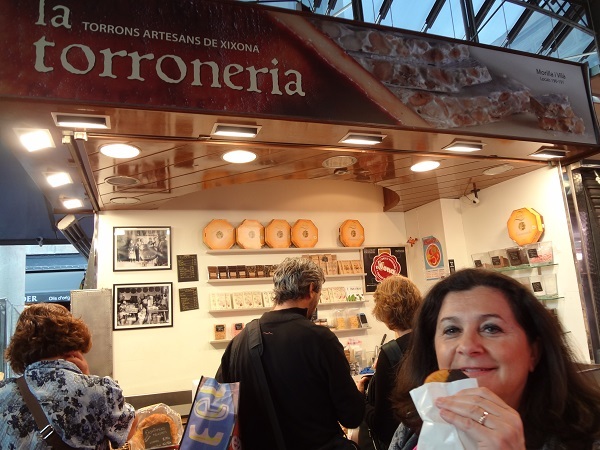 First stop, La Torroneria, a fine chocolate shop. 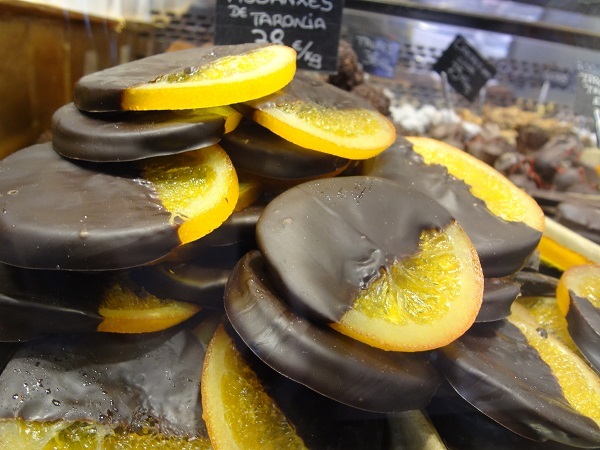 For some reason, I had my eyes on candied oranges half dipped in a thick chocolate. I wouldn’t say I’m normally an orange/chocolate person, but today I was intrigued. And for good reason, they were delicious! I also went for a truffle. Although they appeared expensive per kilogram, the cost for a couple was totally reasonable. Chocolate! I went for a dark chocolate truffle, too. We all enjoyed our chocolate treats. Mom and her candied orange dipped in chocolate. Great choice! And the walk continued. The vendors were each so unique. Check out this egg stand. 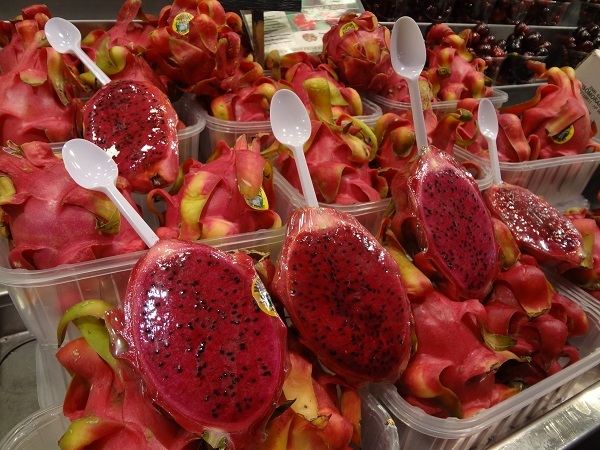 And there were foods, like dragon fruit, that you would never see in this quantity in the States. Dragon fruit on the go anyone? 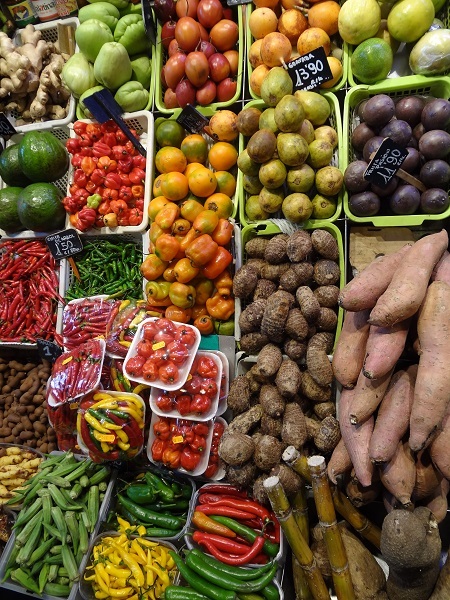 The rainbow of colors from the produce stands was picturesque! 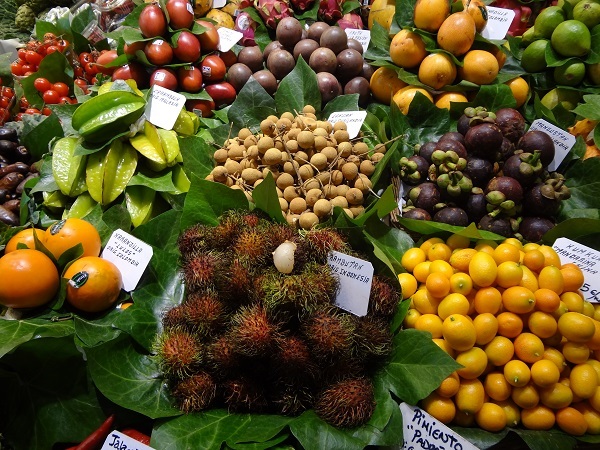 Spiky fruits, fruits of playful shapes, brilliant colors. 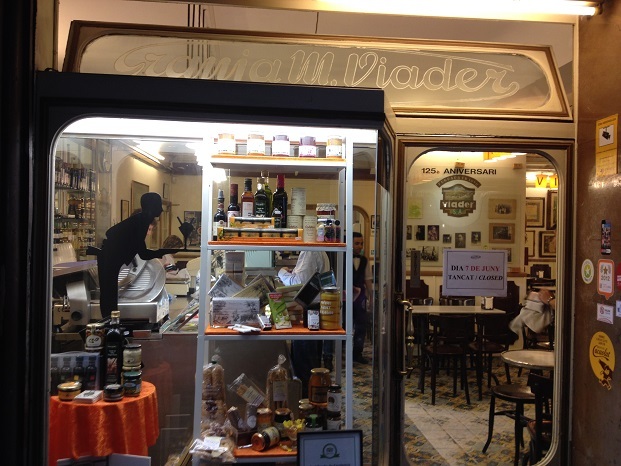 It’s like a playground and museum for foodies, here. 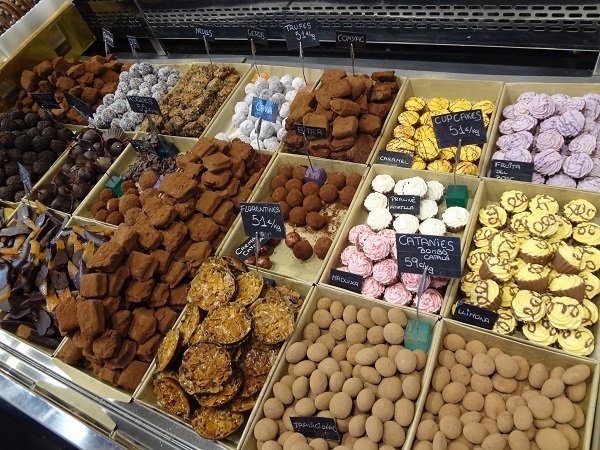 I continued to stop at a few chocolate shops and buy a piece or two to sample along the way. The final chocolate stop of the night was a great one. The nice lady provided us with free samples on top of our purchases. Great customer service! What a night! But it wasn’t over. 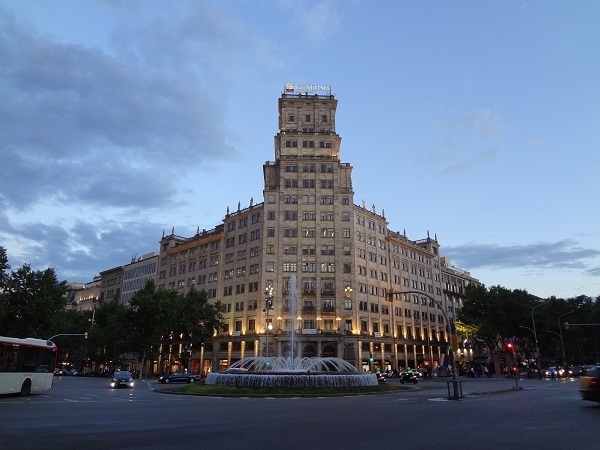 Our walk down Las Ramblas continues…. Jamie says: Wow! 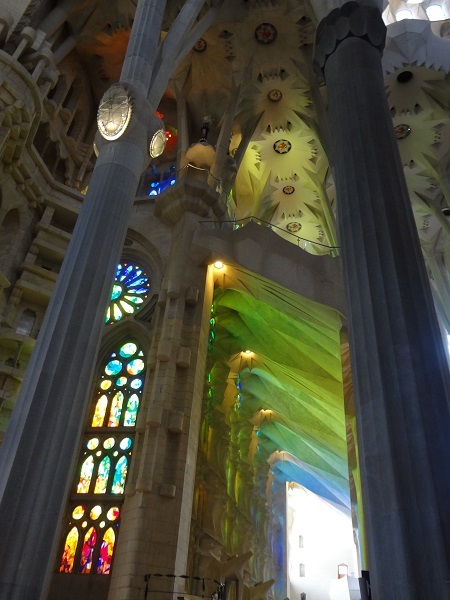 Words cannot describe how breathtaking Gaudi’s Sagrada Familia is. 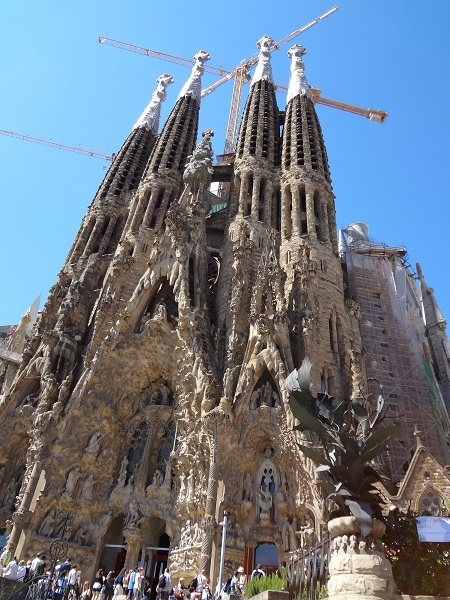 The church is “always under construction,” but this does not detract from its grandeur and beauty. The “sandcastle” church is a must-see destination. The endless intricacies of the East side’s stone exterior are impressive, with a Harry Potter-like feel. 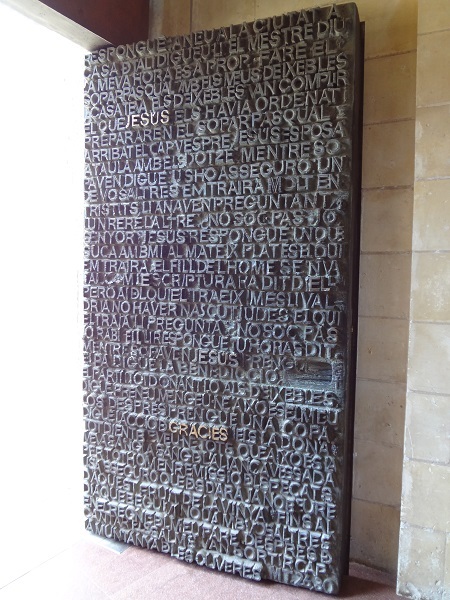 I was impressed with the outside of the church, but it was the inside that stole my heart. The ornate, sky-high ceilings were beyond beautiful. The tree-like columns, unique. 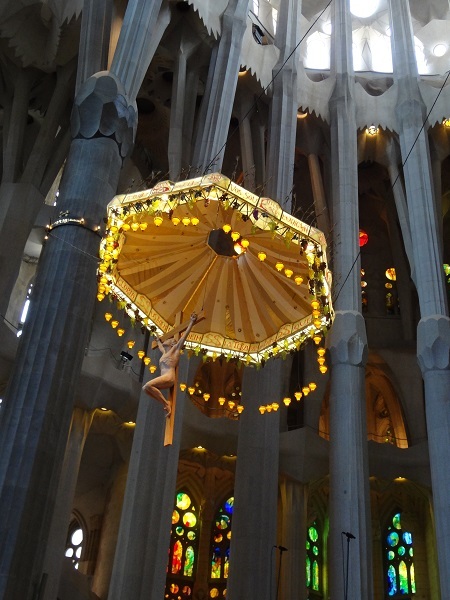 The crucifix on the alter was different than anything I’ve seen before- the swaying wheat and hanging grapes, representing the body and blood of Christ; the lighting; and the jelly-fish like awning. 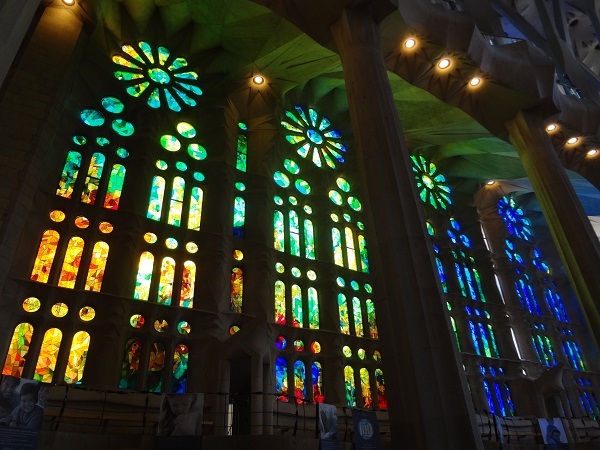 My favorite aspect of the Sagrada Familia was the colorful, bright lighting streaming in through the stained glass windows. It was fairy tale- like. The greens and blues, reds, yellows, and oranges captivated me. It was hard to peel my eyes away. Even the staircases were playful with their spring-like spirals. 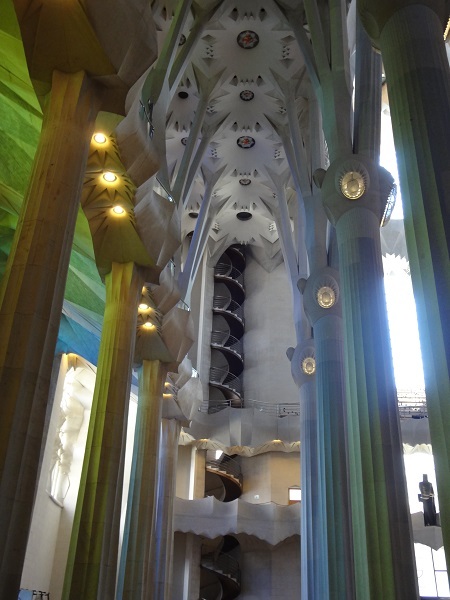 I can now see where the word “gaudy” comes from, although it’s hard to believe that Gaudi himself was a simple and prayerful man with few possessions. Even the back door was impressive. 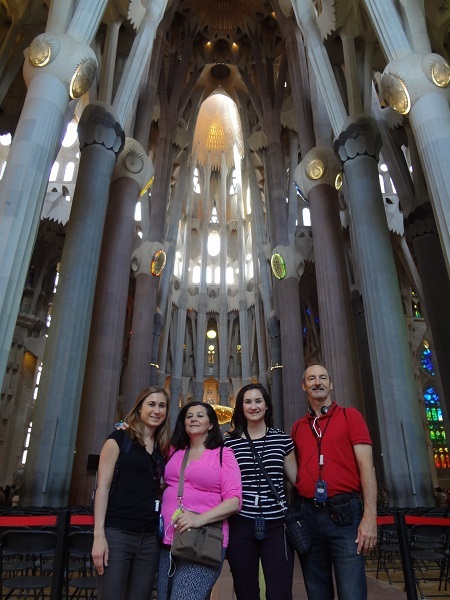 We were all awestruck by this spectacular church. It’s truly unfathomable. 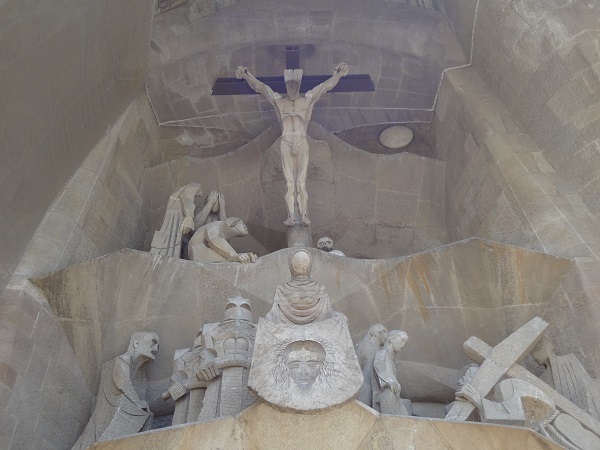 The Sagrada Familia was truly one of the most spectacular pieces of work I’ve ever seen. It was surreal, unimaginable. 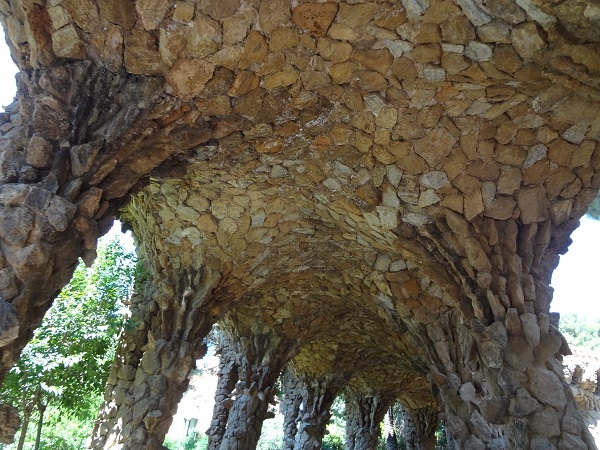 Gaudi, you did it- mesmerized us all. Afterwards, we were h-u-n-g-r-y. 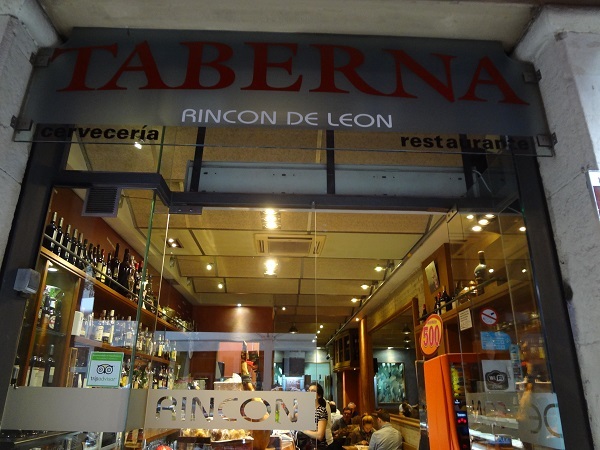 K and I split from Mom and Dad and came across Taberna Rincon De Leon, walking distance from La Sagrada Familia. We sat at the bar for quicker service. 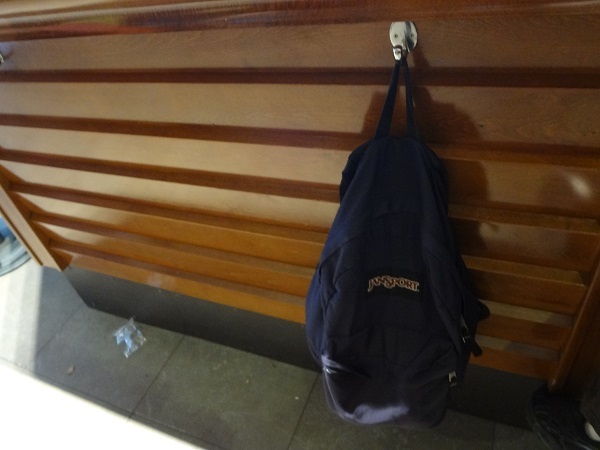 I think it’s so cool how they have purse hooks at the tapas bars and at the discotecas. 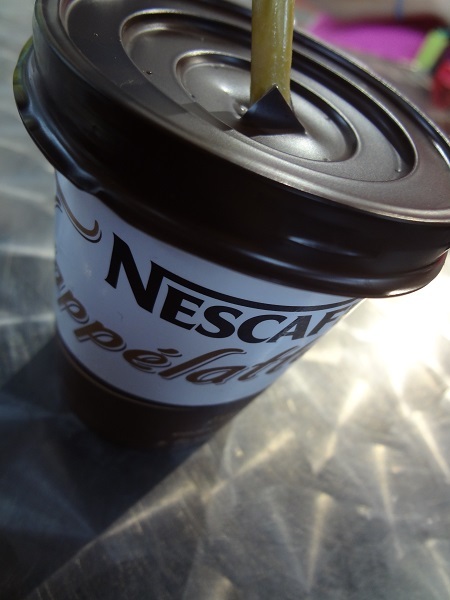 On the way back, K found an open, counter service restaurant with NesCafe. It was mucho dinero for a tiny amount. 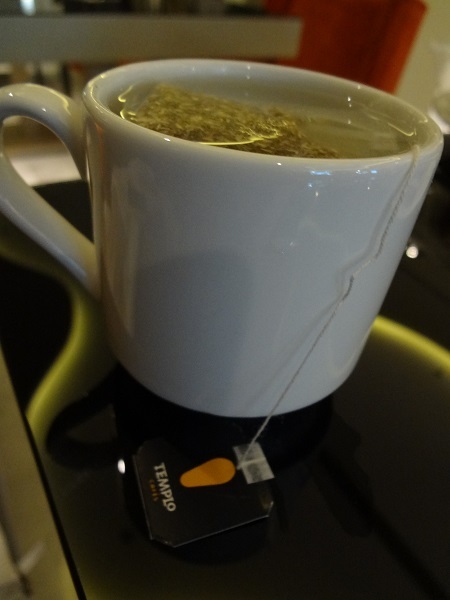 NesCafe- brings me back to Italy! What a day- and it’s not even over! 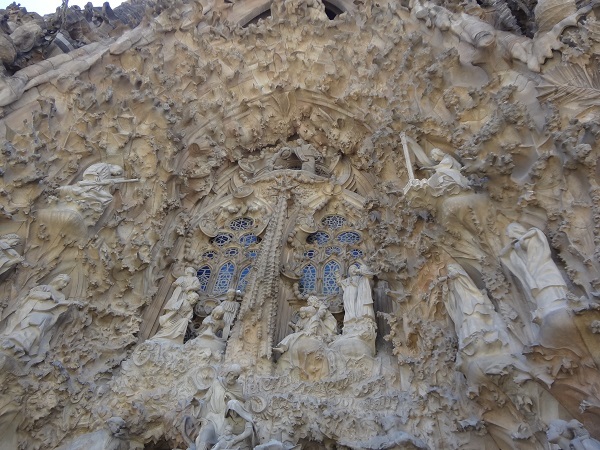 Jamie says: Today was the day to visit the Sagrada Familia (and the Gaudi House)! We bought our tickets ahead of time and avoided the ridiculously LONG lines. 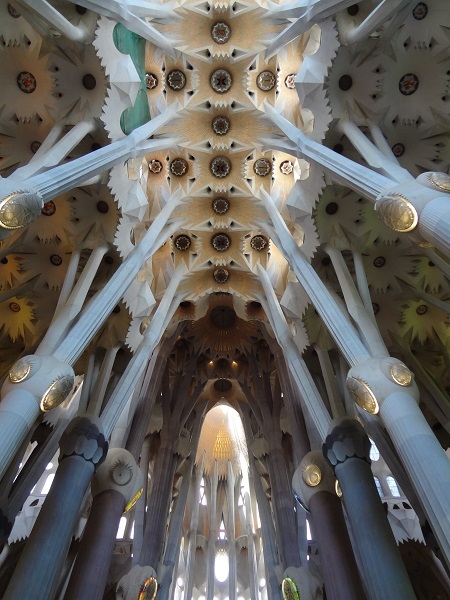 (If I had to pick one attraction to buy tickets for before your visit, I would highly, and I mean highly, recommend the Sagrada Familia.) 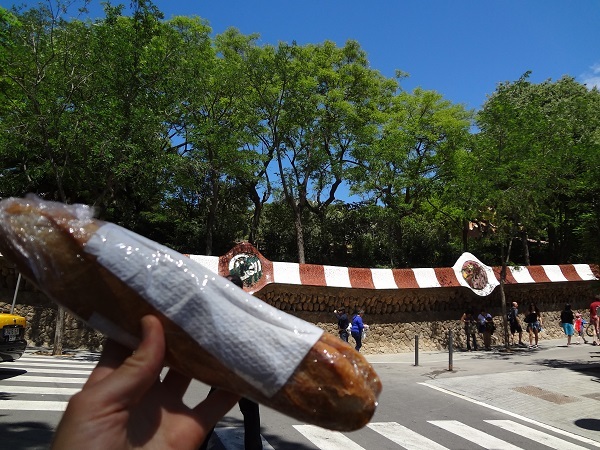 We arrived at the Sagrada Familia for our scheduled tour of the Gaudi House, but soon realized the Gaudi House was not at the Sagrada Familia, but in Parc Guell- another part of town! The taxi driver misread the ticket. Yikes. 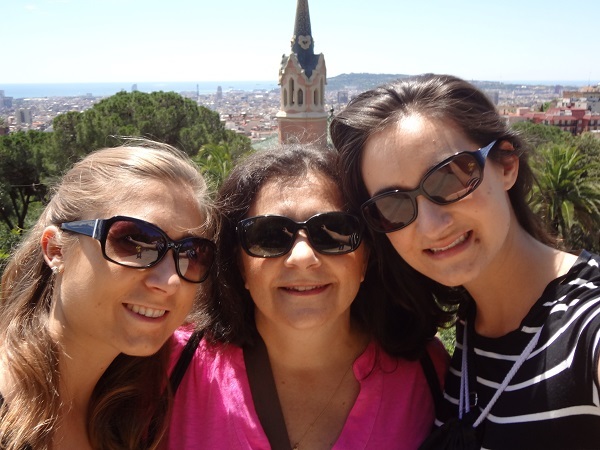 We quickly grabbed another taxi and made our way to Parc Guell. 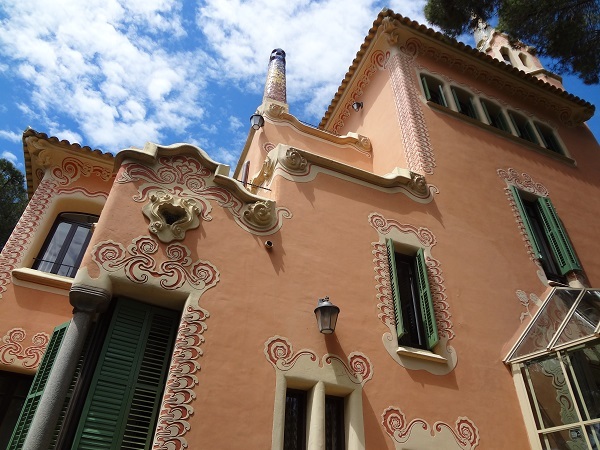 We ascended the path to the Gaudi House. 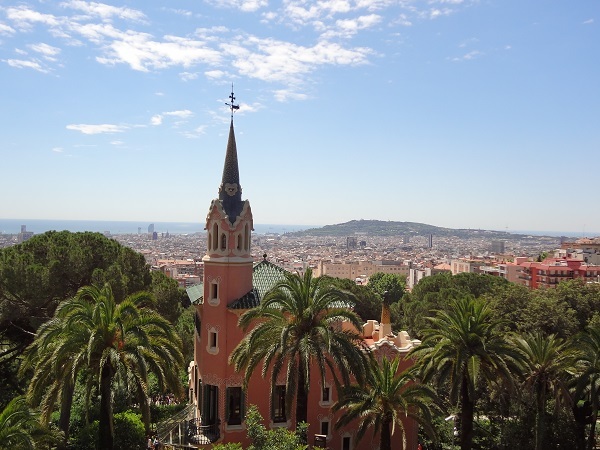 We powered through a self-guided walk through the house (honestly, you didn’t need too much time there), and spent some time walking through Parc Guell. The view of the Gaudi House from above was cool, too. We rocked a selfie…I can’t help but think of my Uncle Peter who, I swear, invented the selfie long before it was popular. Oh, and he was also the first person I know who gave up the family land-line for all cell phones- a man way ahead of his time. I digress. 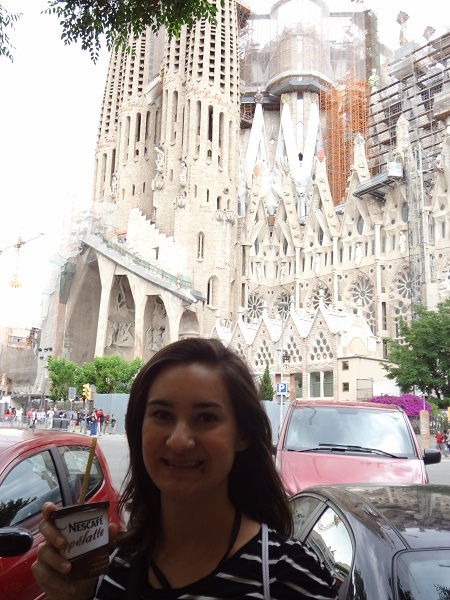 We were determined to get to the taxi in time for our “13:15-13:30” touring of the Sagrada Familia. After all, that was the spark for our trip to Spain! Jamie says: Late last night, K realized we were missing the top sheet for our bed. We laughed historically about it and K made a call to room service. At the last minute, K started laughing and threw the phone over to me. I made the request through gasping laughs. I couldn’t breathe. We felt like middle schoolers making a prank call. I fell asleep instantly (after we received our top sheet, of course), still embraced by my robe. I slept like a baby and didn’t move the entire night- ultimate comfort. I woke up early ready to eat. 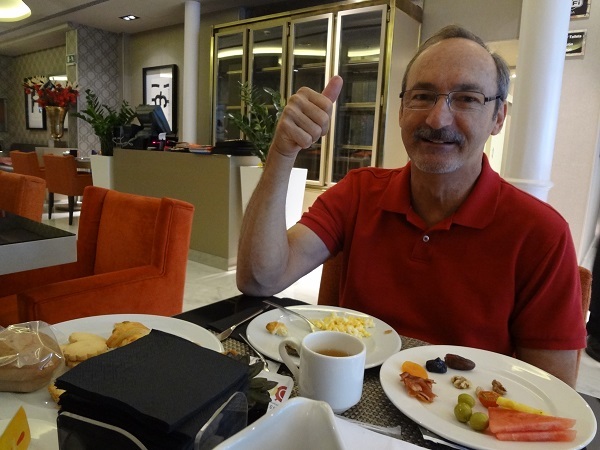 I ventured downstairs for our hotel’s breakfast. 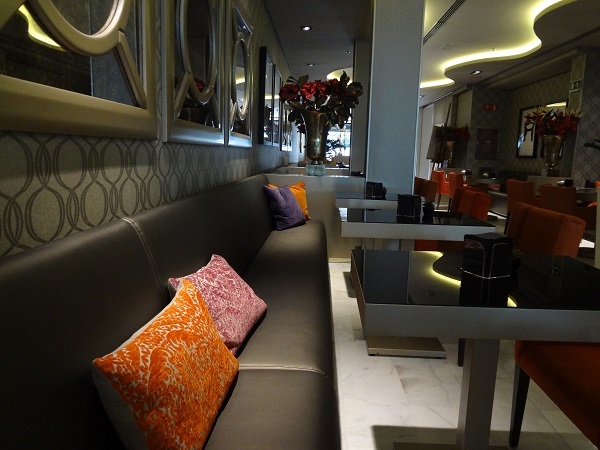 Hotel Indigo- have a seat, it’s time for breakfast! 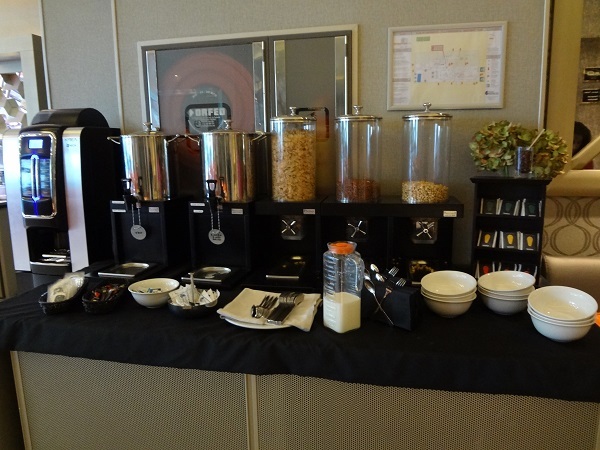 Of all the breakfast buffet options, I craved cereal. And I enjoyed limitless bowls of it. 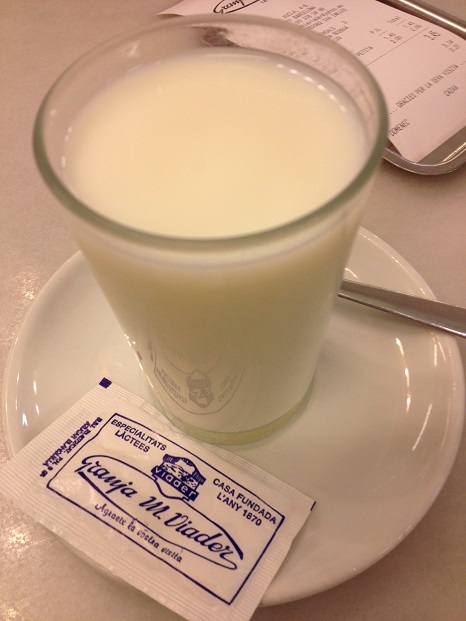 I started with puffed sweetened corn cereal and opted for the cold “soya” (soy) milk, safely tucked away in the bar, over the room temperature whole milk. 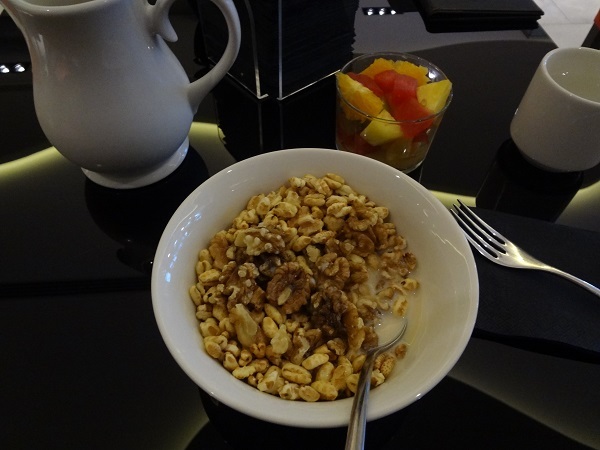 I topped it with walnuts for a nice crunch and to fill me up. It had the perfect amount of sweetness. I grabbed a mixed fruit cup and went back for the last one. 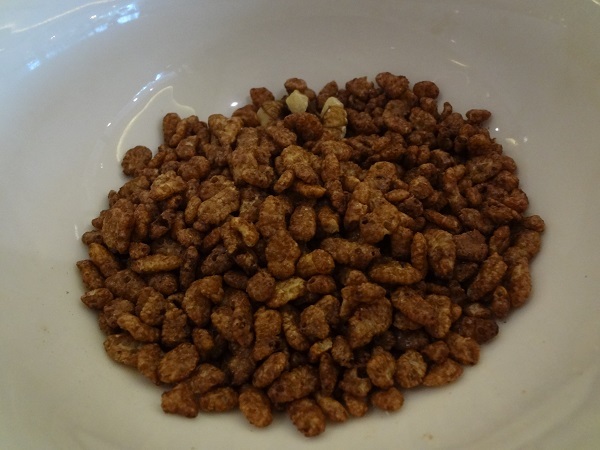 Next, I went for the sweetened cocoa puff cereal. It was chocolately and turned the soy milk into chocolate milk. I was super satisfied. They had a plethora of gluten free options. Jamie says: My “second stomach” opened up, and the Golden Arches called my name- for the first time in ages. 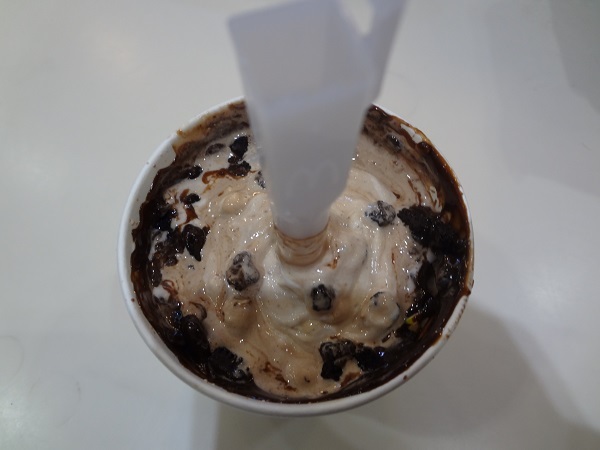 A McDonlad’s McFlurry was in line- with lots of chocolate. I ordered a chocolate McFlurry with Oreos and Peanut M&Ms. It came out as vanilla with chocolate sauce (instead of chocolate ice cream) and the toppings. Regardless, it was chocolate Heaven- and I loved it. We walked the block of discord, a strip of unique, seemingly out-of-place houses. 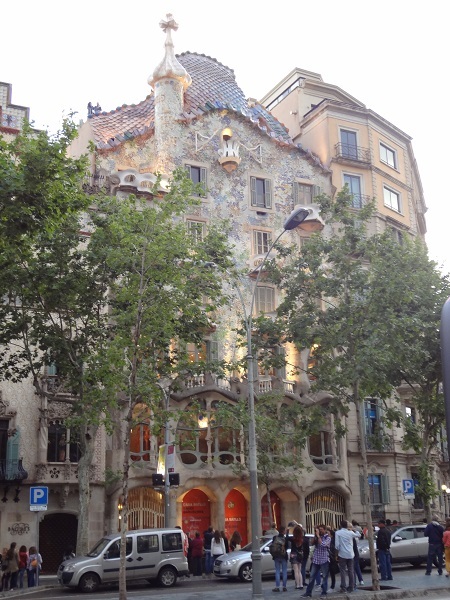 My favorite was a Willy Wonka-like residence by Gaudi called Casa Batllo. It’s playful and trippy architecture was surprisingly captivating. 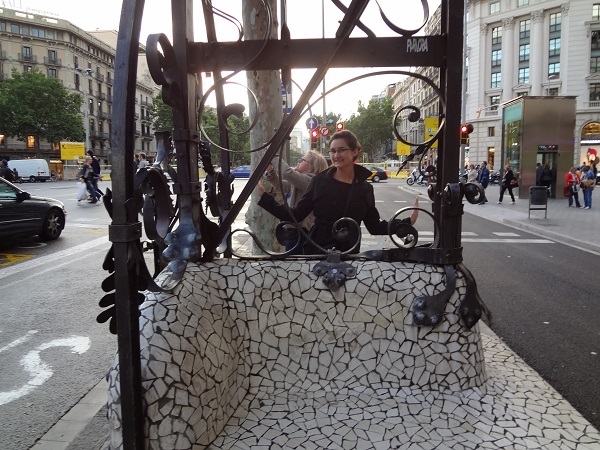 K stopped to pose by an interesting street bench, appropriate for Gaudi-style seating. 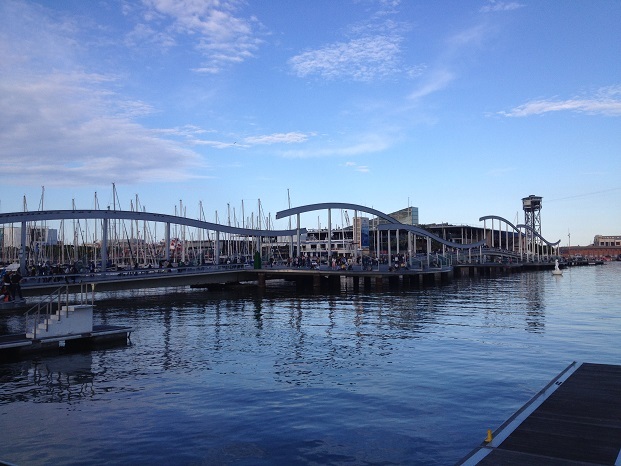 Afterwards, we walked to the Placa de Catalunya, a plaza near the start of Las Rambas, and enjoyed the fountains. We were then ready to call it a night. After all, we did have a super sweet hotel to go back to. 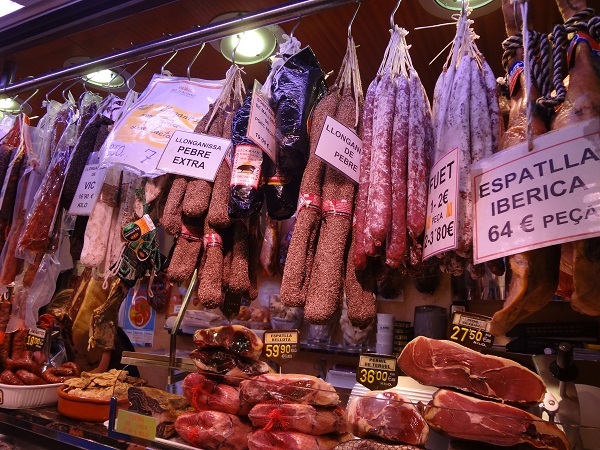 Kathryn says: We found the stairway to tapas heaven in Spain. 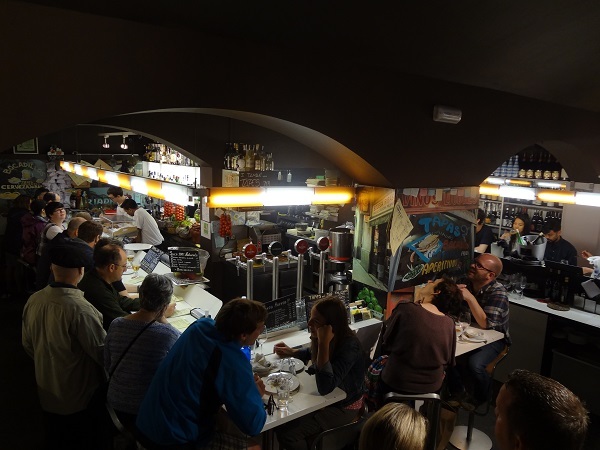 We bypassed the handful of outside tables on the sidewalk and went down the steps of Barcelona’s Tapas 24 into a cozy inside nook that was perfect for a rainy-night, off-the-beaten-path stop for tapas and drinks. 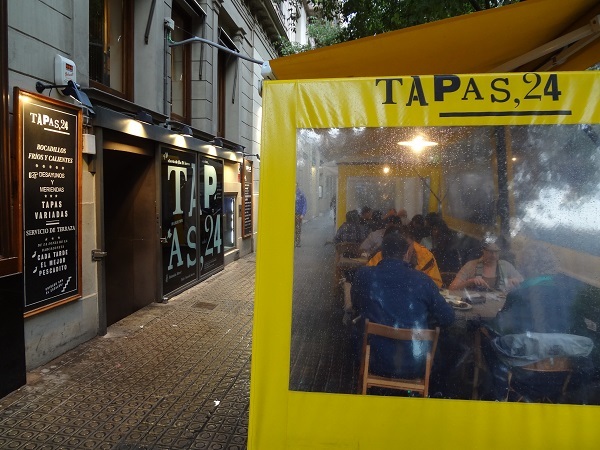 Street view of Tapas 24. 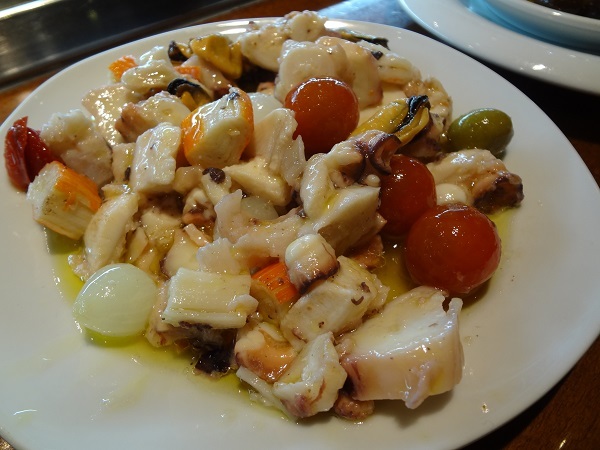 Tapas 24 quickly became one of my top two meals of the trip. 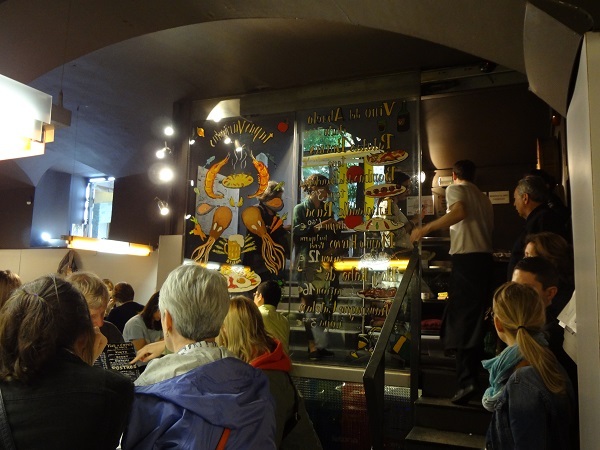 We went for dinner around 7 p.m. and it was hopping. Good luck getting a high-top table or seat at the bar if your party is more than one. 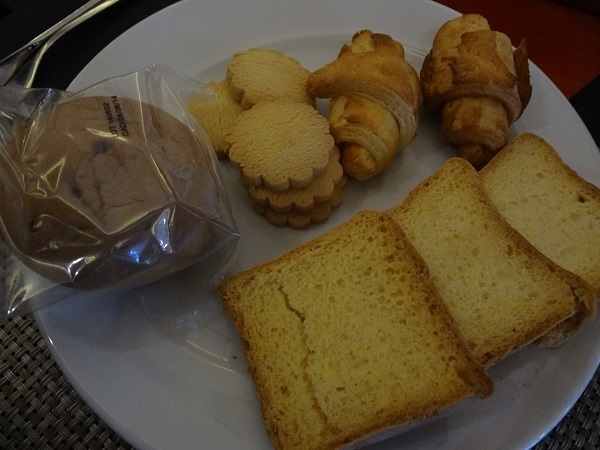 But we didn’t seem to mind the 25-minute wait once we tasted their offerings. Their lemon beer on tap was a light, refreshing, sweet summer drink that went down easily. It reminded me of Lienunkugel’s Summer Shandy. 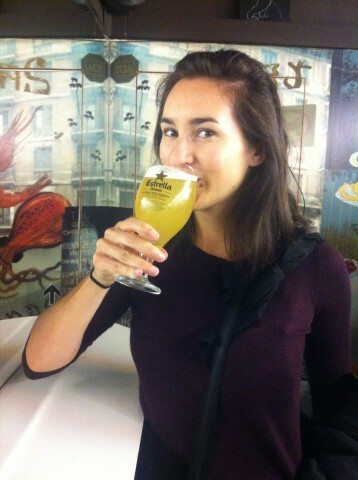 K enjoying a delightfully light, refreshing lemon beer. 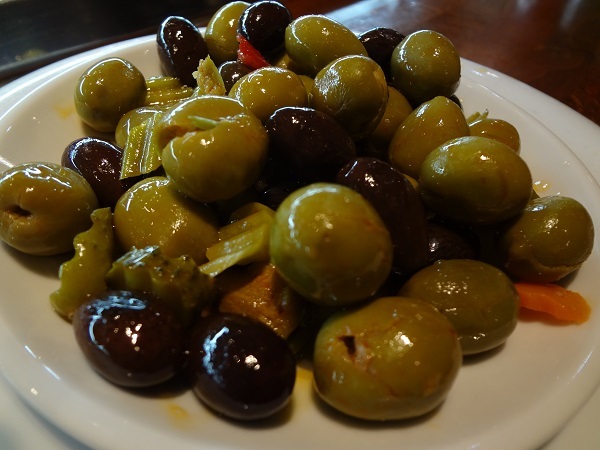 But the real pleasers here were the fresh-made, savory tapas that tasted as scrumptious as they looked. A-plus for flavor and presentation here. I took a Hail Mary attempt at ordering from the Spanish menu before realizing they had an English one, and I was pleasantly surprised. 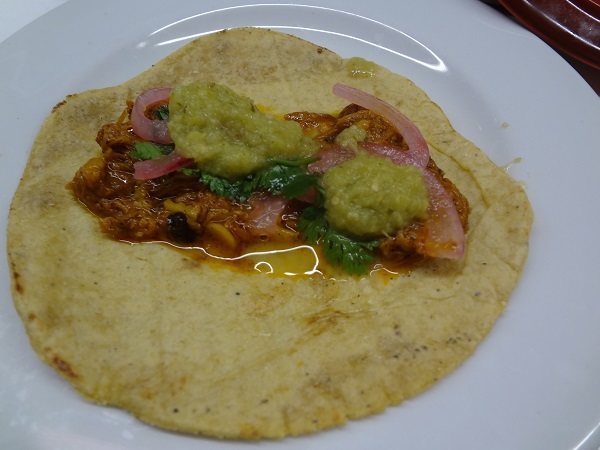 I highly recommend the pork tacos, which came with the ingredients separate so they wouldn’t get soggy. The shredded, tender pork dripped in a curry-like marinade that woke up my tastebuds with flavor. 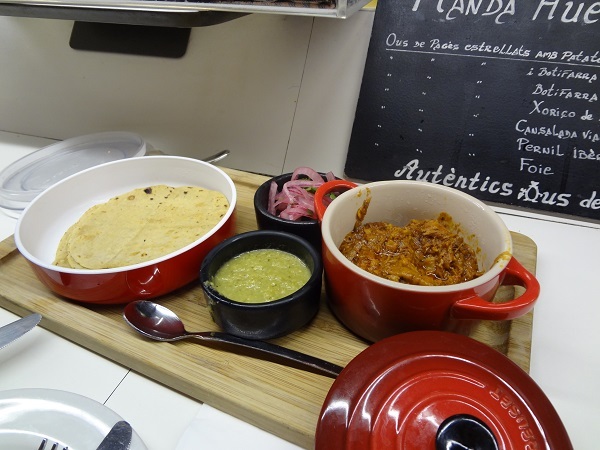 A green sauce on the side and carmelized red onions with cilantro perfectly complimented the pork on the soft, miniature corn shells. 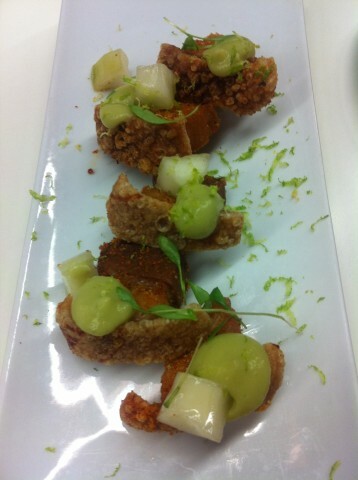 Crispy pork chunks bursting with flavor. Mom chimed in with another finger-lickin’ picking’ — bruschetta. 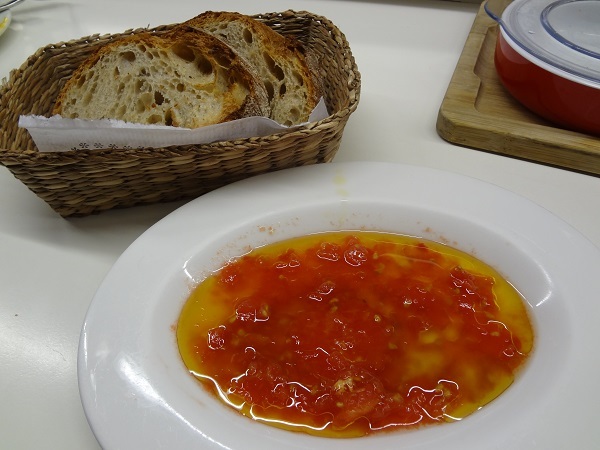 Rustic bread with a crunchy crust and a softer inside nicely absorbed the olive oil a soft, crushed tomatoes. Crispy, rustic bread with olive oil and tomatoes. Jamie jumped in with a healthy choice that ended up being a culinary beauty. 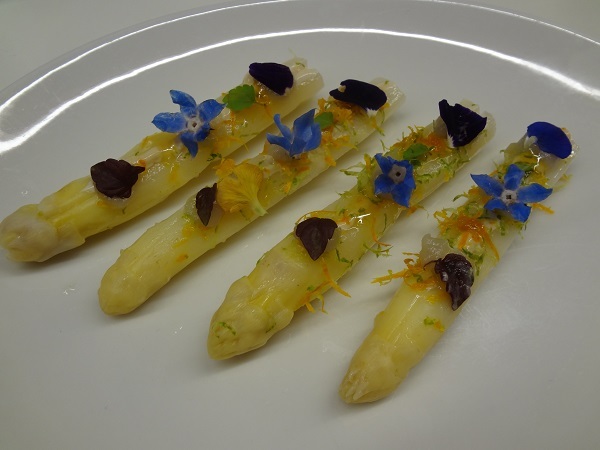 Tender, white asparagus were slit open and filled with a seasoned white mayonnaise sauce. This gourmet treat really surprised us with its presentation. Brigh-blue edible flowers and darker purple pedals lined the top, as well as orange shavings. 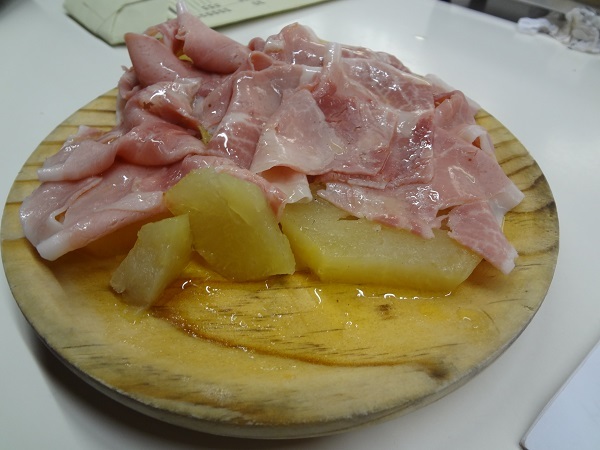 Dad’s gluten-free pick was boiled white potatoes served with sliced ham and drizzled with olive oil. It was simple and satisfying. Simple and satisfying potatoes and ham. Because I was sitting right in front of the dessert display, I worked up an appetite for a sweet ending to the meal. View of our bar seating. 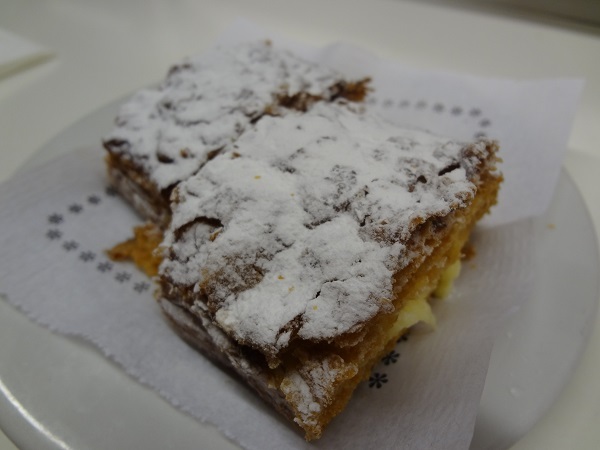 The waiter recommended this dense pastry filled with custard and topped with plenty of powdered sugar. It was rich. Although I like dessert, the savory dishes beat out the sweet one this time.